Painting has started in the dining room! Happy dance! I will qualify this to say the walls are only primed and only the trim has actual paint, but there was a brush, a roller and a can. It is yet another step on my One Room Challenge journey. If you want to catch up on the previous updates on the dining room makeover, here is week 1 and week 2. Another important update: the floor licking continues. Why? Do not be distracted by the weird–yet very cute–baby. We’re here to talk ORC. Back to the program. The prime is thin and the drywall patches show through, but already the white(ish) walls make the room feel much brighter. They also highlight the dirtiness of the popcorn ceiling, which I’m trying to ignore. Over my years of DIYing, I’ve learned that I prefer to paint the trim before the walls. I find it easier to cut the walls up to the trim as opposed to the trim up to the walls, if that makes sense (I’m a freehander, not a taper). While it’s possible that the trim may get spattered or dripped on when I’m painting colour onto the walls, I’ve not had a lot of issues with this, and minimizing the tedium of cutting is worth it for me. The walls will happen this week. I’ve chosen Abalone by Benjamin Moore, mixed at 75%. This is the same colour we used in the adjacent living room, kitchen and hall. The dining room is kind of its own room thanks to the archway, and I considered using a different colour in here. However, Stacy at Blake Hill House made the point that our house is open concept enough that the dining room and living room feel like they’re one room, so keeping the colour consistent makes sense. Thanks Stacy for the input. At the start of the One Room Challenge, I said that if I can just paint the walls I’d be satisfied. I’m feeling like this will likely be achievable. 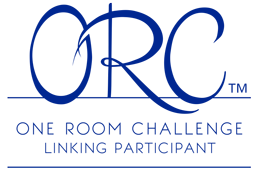 To see the other participants’ progress, visit One Room Challenge. The designer participants share their updates on Wednesday and the guest participants will be posting on Thursday. Who else has a live-in inspector for their DIYing? What do you paint first, trim or walls? How do you choose paint colours in adjacent rooms? When Matt and I bought our first house, two of the rooms were painted red. 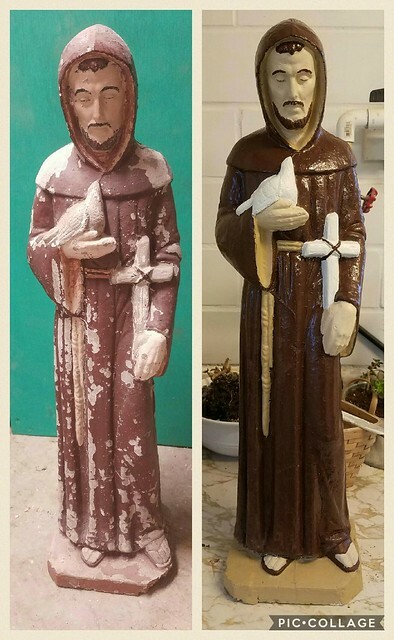 We repainted one, but kept the other. By the time we moved, I was so tired of that red room. 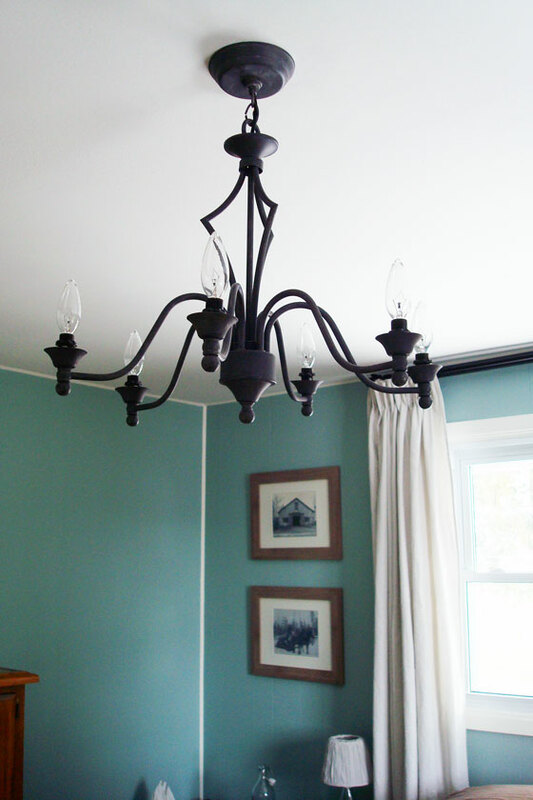 As I’m gearing up to paint the dining room, one of the colours on my list is chocolate brown. I think it’s a holdover from our first house where top on my list to replace the red was chocolate brown. However, I’ve learned since moving here that I don’t love strong wall colours. I get tired of them quickly. I don’t feel as relaxed in a vibrantly coloured room as I do in a subtle one. For example, our bedroom. I painted it trendy Hale Navy four years ago (holy moly how is it already four years ago?). It looks awesome. But I don’t know that I love it and sometimes I think I’m ready for a change. In contrast, the living room, hallway and kitchen are all a light greige (Abalone from Benjamin Moore mixed at 75% intensity). I love this area of our house. I spend most of my time in these rooms and I always feel very comfortable. Greige may be boring and a non-colour, but it works for me. I’m likely never going to be a white walls person. They look nice on Pinterest, but they’re not something I want to live with. I’ve learned I need a bit of colour. But not too much. So as I’m working on the dining room, I’m not thinking chocolate brown any more. I’ve decided I’m going to stick with my tried and true Abalone. Our dining-living room is open concept enough that picking the same colour makes sense, and more importantly it’s a colour that works for me. 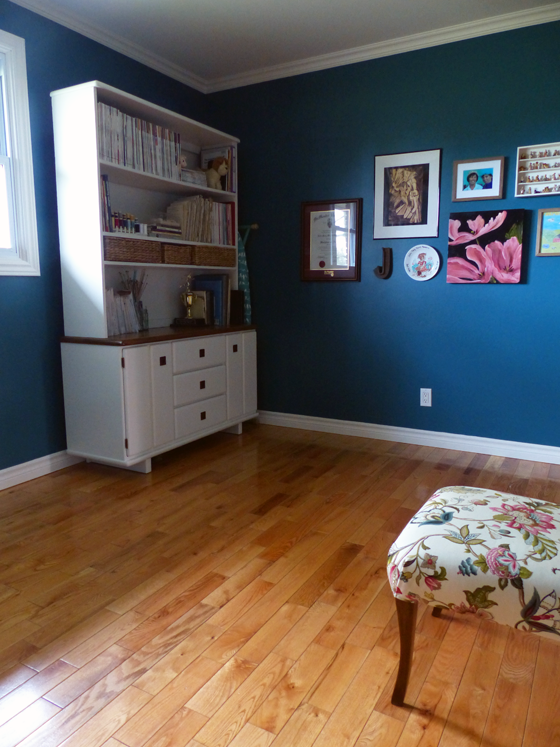 Do you have a tried-and-true paint colour? Are you a fan of vibrant rooms, or do you prefer subdued colours? Who’s on team white? Do you have any painting regrets? 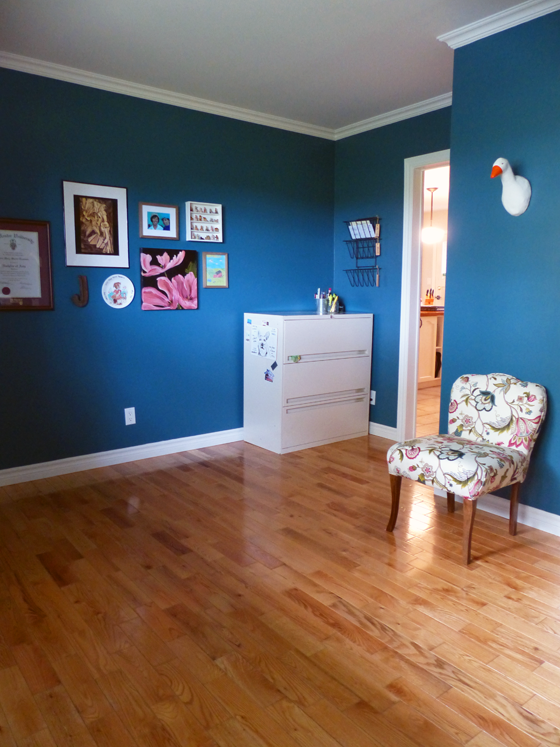 For a long time, I’ve loved the idea of a turquoise nursery. So when we were transforming my office into Ellie’s room, I knew I didn’t want to change the colour. However, we did have to do some painting when I removed my gallery wall and my display of vintage hats in favour of more baby-friendly art. Sooooo many holes (and weird reflections from the light fixture). 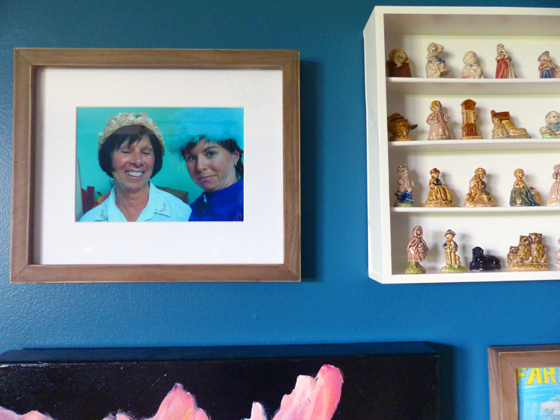 There are a few tricks to patch and repaint a gallery wall. Once you’re happy with the patches, it’s important to prime. Painting directly over the “raw” patches will result in “flashing.” This means dull or shiny spots on your wall. While the colour may look the same, the patches will still be visible as the drywall paste absorbs the paint differently than the surrounding wall, which has already been painted. Prime gives a fresh surface for your paint to adhere to. You can limit your priming to just the patches, but make sure to cover all of the raw drywall paste. The next step is paint. Again, you don’t have to paint the whole wall. Cover the primed area completely with paint. The final step is to repaint the wall–the entire wall. Time, sun or slight variation in the mix stirred up by the paint store may lead to variation in your paint. So while your patches may only be in one section, repainting the whole wall ensures that the paint looks completely uniform. However, you do not need to repaint the whole room. Stop painting at the corners, either an outer or an inner corner works. 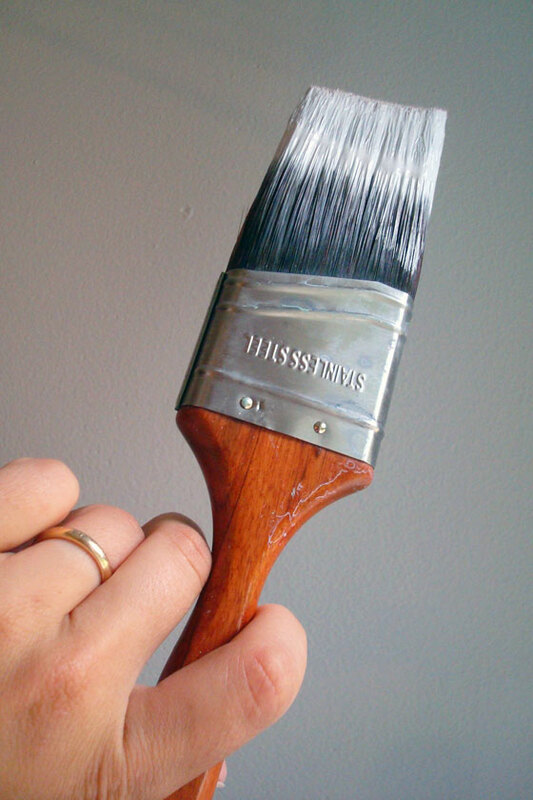 Even if your paint is a slightly different tone, the difference won’t be noticeable if you “break” at a corner. 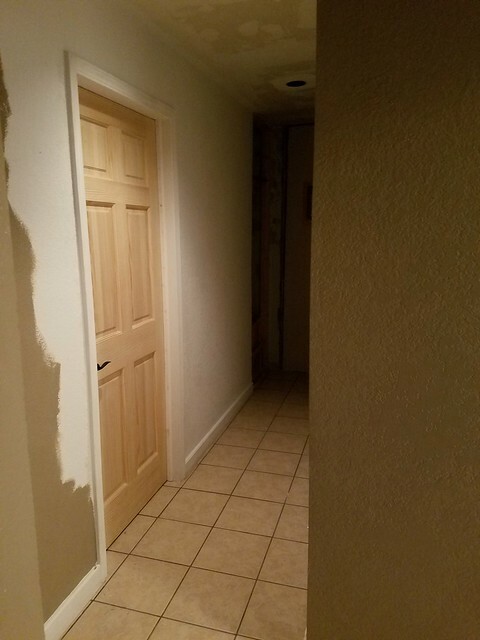 The result will be a seamless finish and no one will be able to tell that you repainted. Thanks everyone for your good wishes on my last post. Matt seems to be recovering well from his surgeries. We’re hopeful that our follow-up appointments over the next few months give us more positive news. The guest room has become Matt’s treatment room where we can lay out all his drops and ointments, and the patient can receive them. 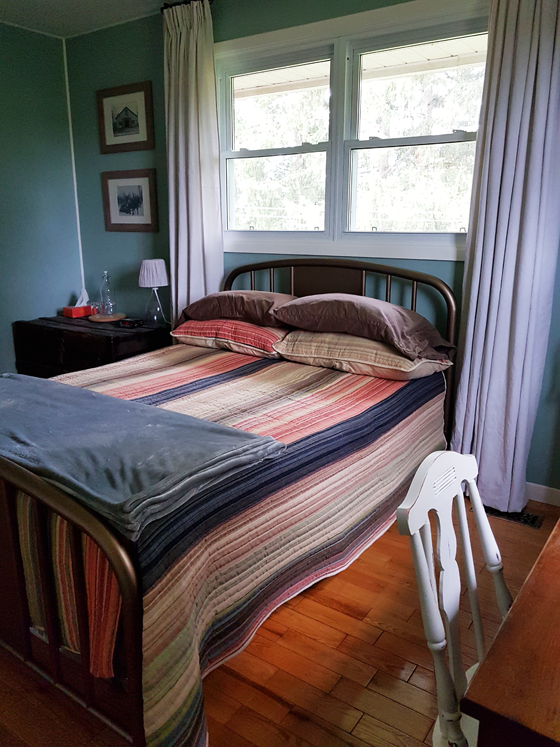 You may recall that back when I shared the finished guest room nearly, oh, a year and a half ago, the room was missing a key component–a bed frame. Well, we’ve finally managed to remedy that. 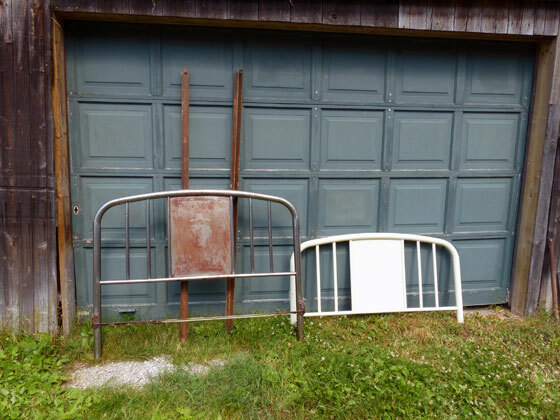 We had an old metal bed frame that was in my cottage bedroom growing up and then Matt and I used it in our first house. This style of frame has become pretty trendy, and I’m seeing various versions all over the web, so I wanted to keep it. Plus it was free. However, the finish was in rough shape. During the cottage days, it was a greyish, pinkish flesh tone. Matt and I repainted it cream, but it was our first foray into spray paint and the finish was drippy and chipped (and dusty after living in the barn for several years). One of my home goals from 2016 was to strip the frame. I had hoped that the metal was in good enough shape that it wouldn’t need to be painted and it could just go right into the guest room. 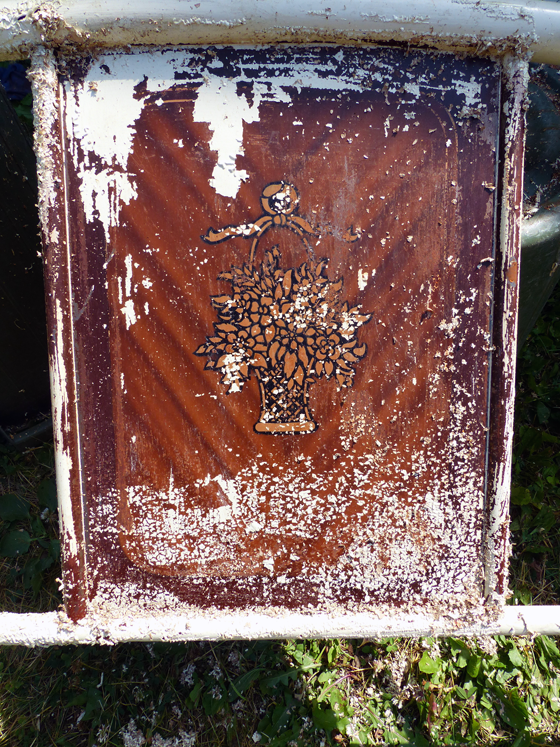 Stripping paint off metal is very similar to stripping paint off wood. I used my usual chemical stripper, scrapers and wire brushes. 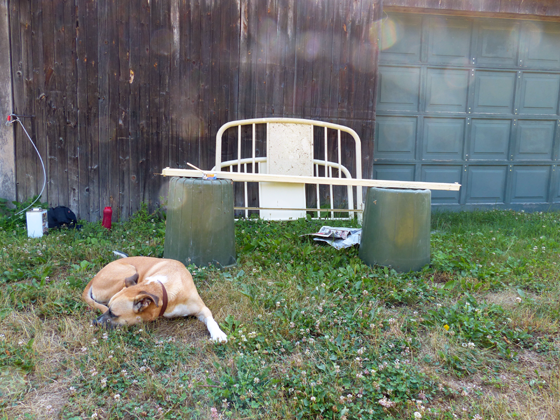 It was a fiddly process because of all of the spindles and layers of paint (and as usual my sidekick was no help). The original finish on the bed was a faux wood treatment. It was not what I expected to find at all. I had seen glimpses of this stenciled basket through the subsequent layers of paint and thought it might be embossed into the metal. That was not the case, and it was a feature of the original finish. Unfortunately, the metal was not in great shape once I got the paint off. 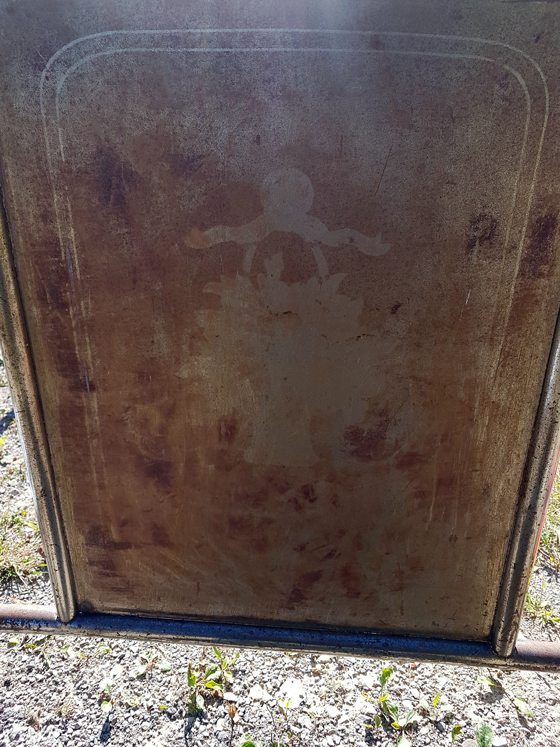 There were scratches and pits and rust and the welds were obviously different colours. I knew I would have to repaint the whole bed. Faced with that reality, I stopped stripping. I had removed the paint from the headboard and two siderails, but I had visions of simply adding another layer of paint to the footboard. But I knew that wasn’t what I really wanted. If I’m going to do the job, I might was well do it right and take the footboard back to the original metal. 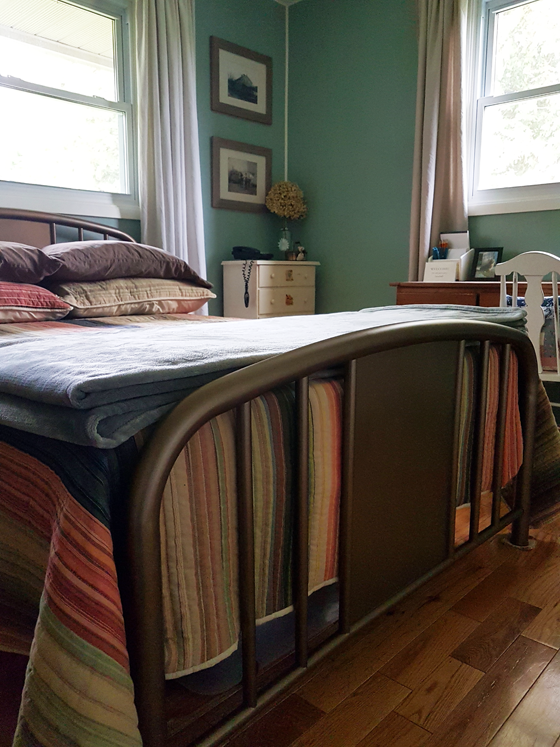 Plus the footboard is the most visible part of the bed, and I was worried that the chips and goopy layers of paint would show through my new finish. 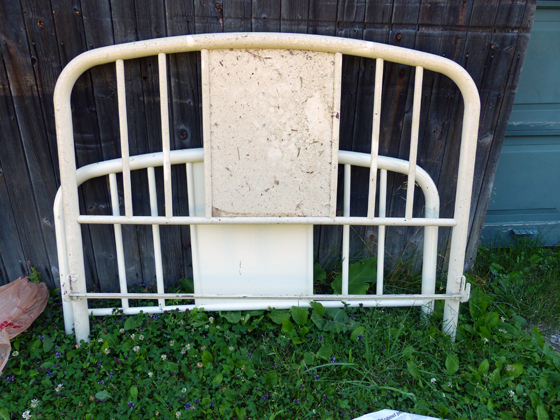 So this summer I returned to the bed frame and finally stripped the footboard. Then I waited for the weather to cool off enough to paint–and to figure out what colour I wanted to paint. 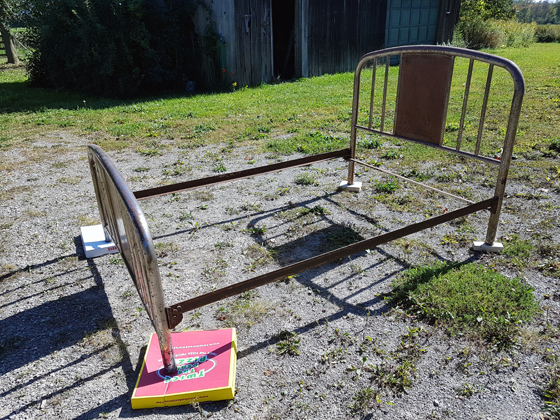 So many of the metal bed frames I see are black. I love the look. But between the trunk that’s already in the room, the chandelier and the curtain rods, I already have my pops of black. I didn’t feel like I needed more. The second place colour seems to be white, but there’s also a few white pieces in the room, we’d kind of already done this with the cream paint and honestly I wanted something more interesting than white. I sampled a bunch of colours, but that didn’t help. Finally, I went to the store and just picked a colour. 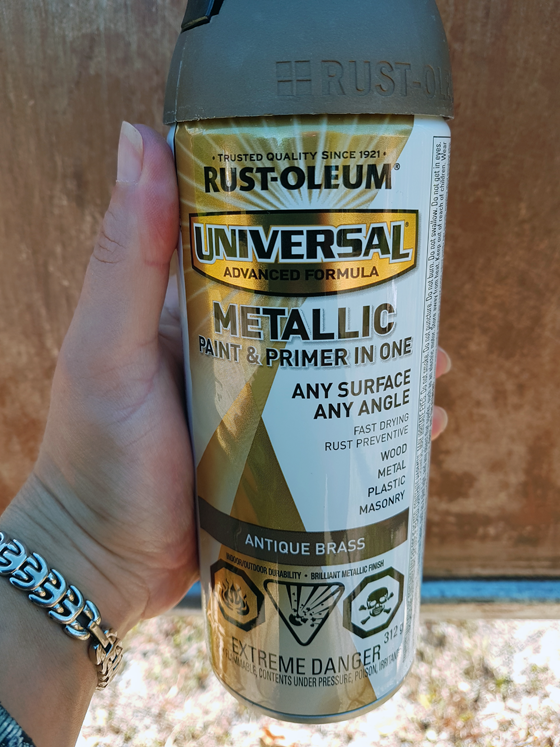 I chose Antique Brass by Rustoleum. I liked the idea of echoing traditional brass beds. Plus some of the hardware in the room on the desk and the chest of drawers is brassy. I figured, if I didn’t like it, I could always repaint. At least I now have a smooth surface to do so, and I wouldn’t need to strip again. We set up the bed on the driveway, and I went to town. 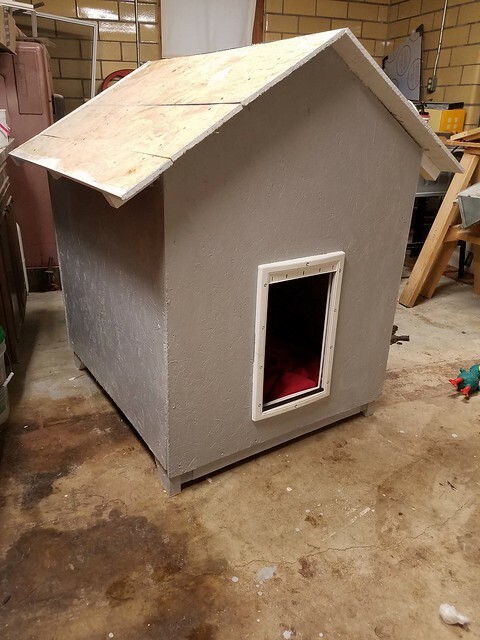 Given the state of the metal, I think I could have used a primer, but after a brief sanding I went straight to paint–and ended up having to run to the store to get more cans. In the end, all of the scratches were covered and the finish looks good–much better than any of the previous finishes. After a week of airing out in the driveshed, we brought the bed in and set it up. And now, I can finally say the guest room is done. Ready for our next patient guest. My office. A space that’s completely my own. The last bedroom in our house. It’s done. And I’m so happy with how it turned out. 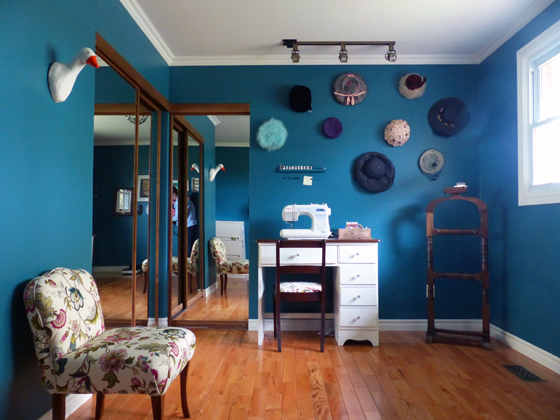 While I’ve used the word “office” to describe this room, it’s really a sewing, crafting, creative space. It’s filled with the things that I like to do. The things I like the most and that mean the most to me (Bill!). I love that I now have an organized room that I enjoy being in. This wall used to be filled with boxes that had been packed since we moved in five years ago. 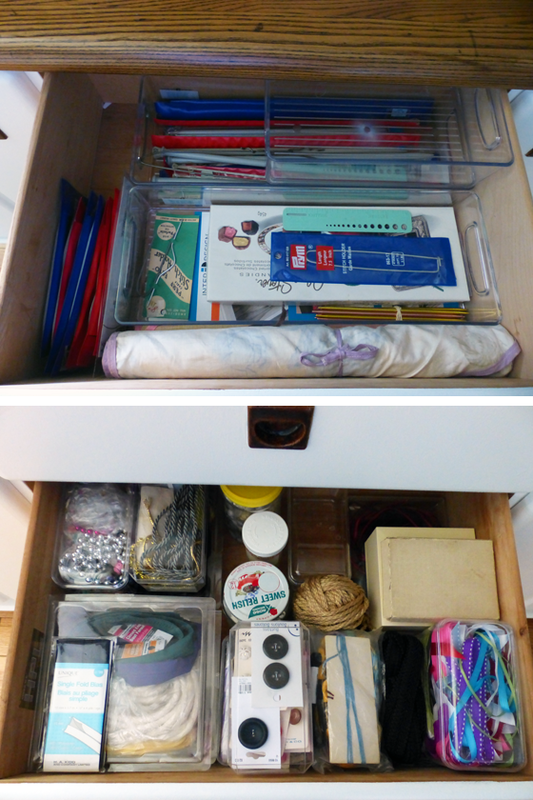 Now, the thrifted china cabinet holds sewing and knitting supplies, magazines and memorabilia–and keeps them all organized. Growing up, I never won a trophy. When we were dating, I mentioned this to Matt. 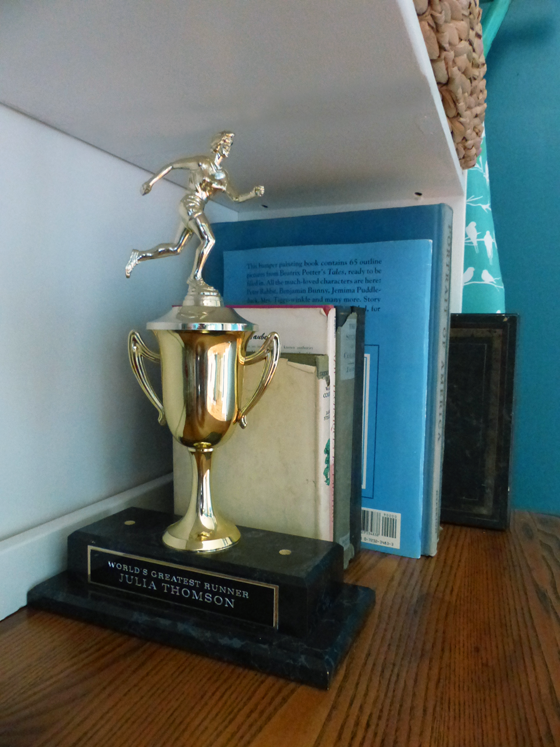 One fall, after I ran my first 10K, Matt presented me with a huge trophy. It meant so much to me that he did that. However, the trophy was truly huge. I took it apart and then put it back together in a slightly smaller configuration, and it fits easily on the shelves. 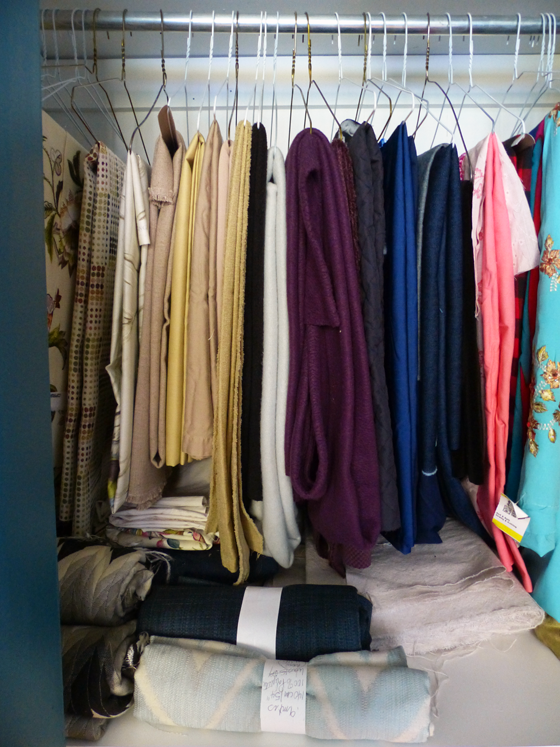 Reconfiguring the closet was also hugely helpful to keep everything organized. Hanging up my big pieces of fabric makes it easy to see what I have and ensures that I’m more likely to use them. 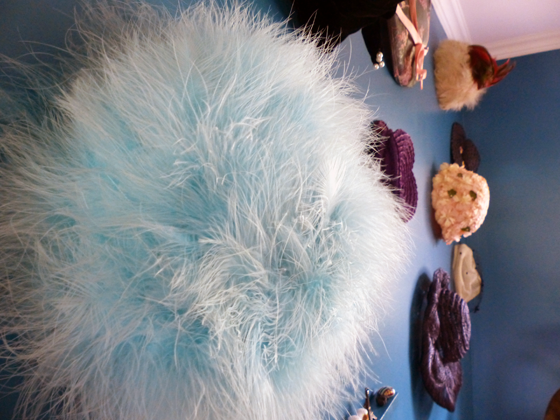 When it came to art, I wanted to display some of my favourite things–like this collection of vintage hats. My Mom taught me how to sew. She learned from her mother–the original owner of most of these hats. In fact, my great-grandmother made one of the hats that is hanging on the wall. I love the idea of a time where people regularly dressed up to go out, and hats were part of the outfits. I don’t live in that world, but I can still enjoy these hats by having them on display. 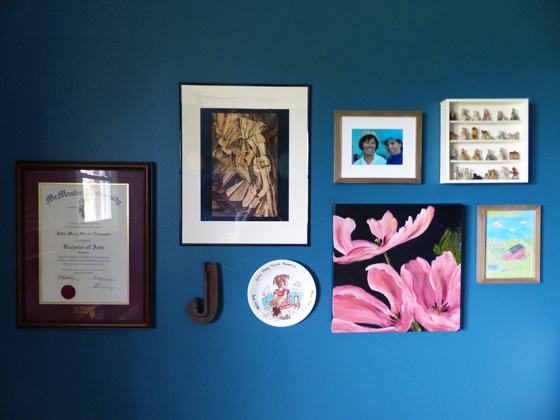 The gallery wall is another showcase of my favourite things. The same grandma that taught my Mom to sew also had a collection of Red Rose Tea figurines. Often when we were leaving her home after visiting, she would give us a figurine to take home. A few years ago, I decided to collect a full set of the nursery rhyme statues. Between gifts and flea markets, I got every one. However, I’ve never had a place to display them. Now I do–along with a fun photo of my Mom and I modeling some of the hats. Another small collection that is finally on display is my thimble collection. Matt’s parents travel a fair amount, and my MIL buys a china thimble for me pretty much everywhere they go. 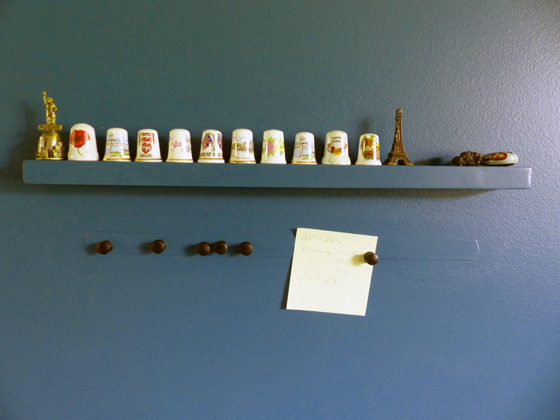 I made a really small shelf to go above my sewing machine, and it holds all of the thimbles perfectly. A magnetic strip from Lee Valley, painted the same colour as the wall, holds sewing instructions where I can easily see them as I’m working. While I’m not an official participant in the One Room Challenge, which concludes this week, it definitely helped motivate me to finish off this room. I love that every item on my to-do list is crossed off. You can check out all of the official ORC participants at Calling it Home. There are so many little details that make this room work really well for me. And I love the beauty and the sentimentality that I was able to incorporate as well. While the ORC motivated me to finish the office, the room itself is now motivating me to keep crafting. I’ve returned to some projects that have been hanging around for a little while and had a super productive sewing month where I’ve churned out a dress, jacket and several pillows. I’m excited by what else this room is going to inspire. Thanks for following along on the makeover. 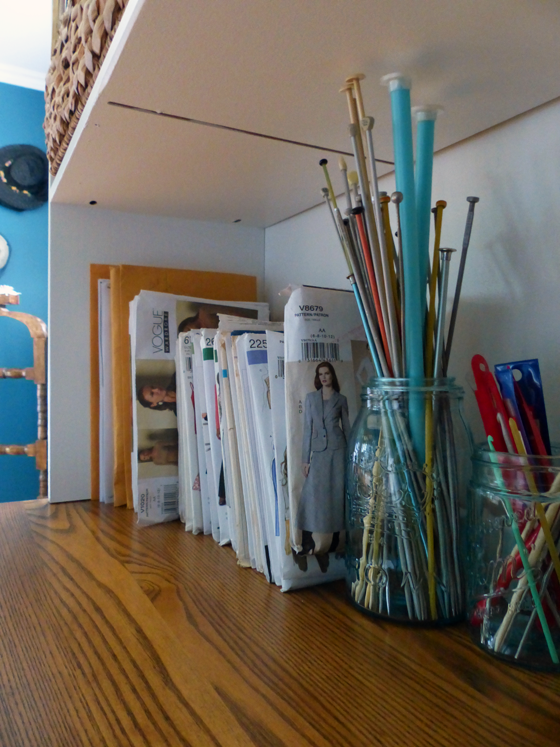 Do you have a crafty creative space at your house? 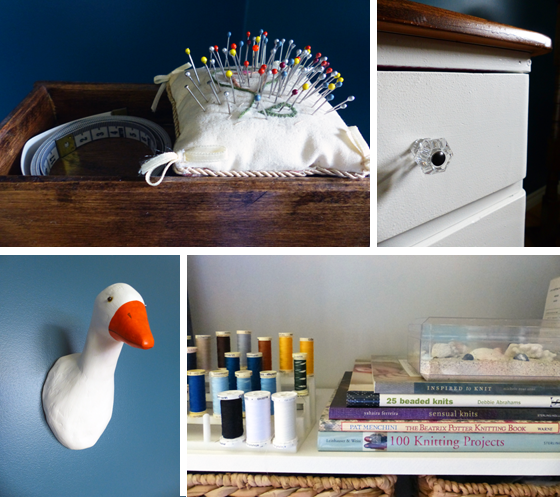 What helps motivate you to finish projects–whether big like a room makeover or smaller crafts? Do you have a favourite collection on display? 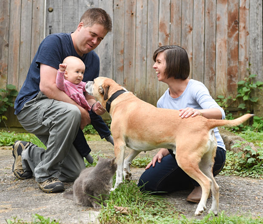 Sarah in Illinois is here today with an update on how she’s done on her monthly projects. If you have been keeping track, it’s been three months since I announced that I was setting a goal of one project a month. So how have I done? Let’s start with Blitz’s house. It’s painted, and that was my goal. I really thought that I would have the roof shingled too, but that didn’t get done. For the paint, I used some concrete floor latex epoxy that we had sitting around. It would not have been my first choice if I went to the store and picked it out, but I think it will work very well. And the epoxy will help protect it from the weather. My second project is by far my favorite and the one I am most proud of. 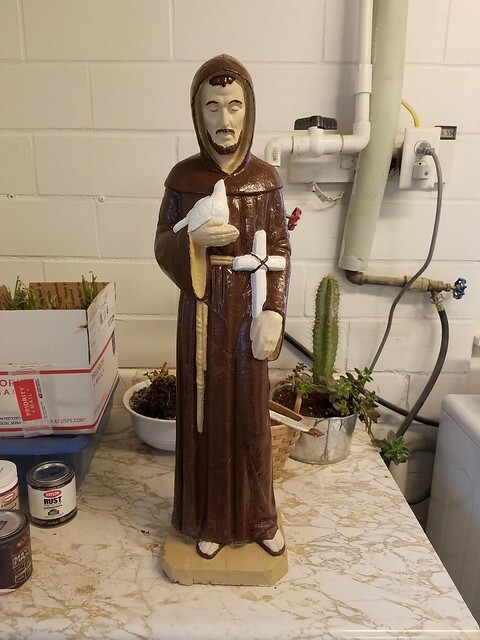 I told you that we had sneakily taken my grandma’s St. Francis statue from her yard. It was starting to crack and the paint was faded and flaking. When I last posted about it I showed a little progress. Yes, that really is the same statue. 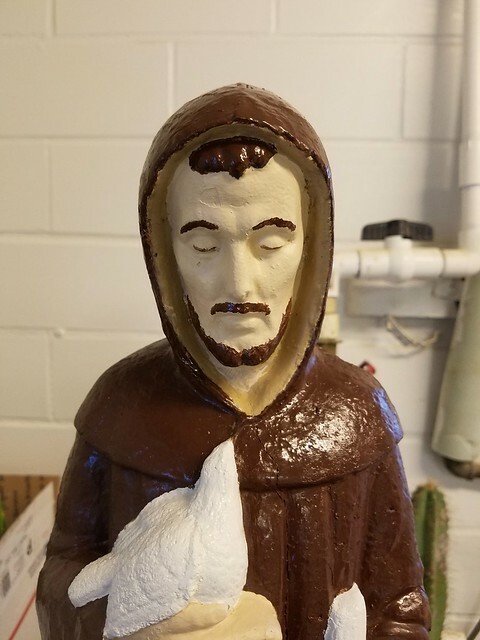 I want to maybe touch up his facial features a little, but I can say that I am very happy with the outcome, and I can’t wait to give it back to my grandma. For my final project from my list I was supposed to prime and paint our hallway. I will call it about 75% complete. It is primed, and I did start painting, but I really thought I had more paint left. If I have more, I sure as heck can’t find it. So I will take what little info I remember about it (it is semigloss and the color is called Toll Booth), and I will go back to where I got it and hope they can mix me up some more. I am frustrated because the color runs throughout our house and if for some reason I can’t find a match I am going to have quite a problem. So there you have it, not completely done, but I have made some headway. I love having this goal out here in the public because it made me focus on my three projects and not get distracted like I so often do. To keep motivated I will set my next three months goals in my next post. You can be assured that they will be garden related. Good job, Sarah. That statue looks amazing. Your grandmother will be so surprised. That’s really special. I’ve done the paint colour match thing before, and it’s worked out fairly well. Just to be safe, I suggest trying to make the “break” at a corner or other dividing point.